Oh, Beau. A suave, handsome name for a suave, handsome clock. First, a picture of the beauty. The writing on the clock reads “Perry Hger” above and “a Monflanquin” below. First off, a history of Morbier (or Comtoise) clocks. They were made in villages in France (Morbier being the name of one such village and Comte a region in which the clocks were commonly made). Historically, farmers would work together during their slow times to work on a clock communally, and then would sell it to a retailer who would put on the finishing touches, such as their name (“Perry Hger”) and the village or region it was from (Monflanquin). They used crown escapements through the 1850s, dating this clock to post 1860 because it uses an anchor escapement. This clock also has what is descriptively called a “lyre” pendulum which was popular during the mid-19th century. Now for a bit of family history about this clock in particular. For those who don’t know me personally, my paternal grandfather was a ’43 West Point graduate and was lifelong military. He retired as a Colonal in the U.S. Army. He met my grandmother in Austria in 1947 when he was serving as aide to Lt General Keyes who was High Commissioner of Austria, and she was on her second tour with the Red Cross, having previously done a tour in the China-Burma-India unit. They married and lived in Austria for a time before she moved back to the States, and their home changed frequently after that. Around 1979 my grandparents Virginia Trice Brier and Colonol John Klotz Brier made a trip to France and while there visited an old West Point classmate of my grandfather’s, Bernard Rogers Supreme Allied Commander of Europe (SACEUR). My grandmother collected clocks of all types, at least 70+ at the time of her death in 2011. After their trip (during which my grandmother acquired the clock) they were escorted to their plane by the SACEUR himself (or at least an appointed entourage). Flustered that the SACEUR himself was sending personal guests to their plane, the plane crew hurriedly made room for the guests, only to discover that the guest of honor was a large Morbier clock that my grandmother hadn’t wanted to get hurt on the journey. The clock rode home in first class. Now for a little about the inside of the clock itself. A few months ago the clock was purposefully stopped while guests were sleeping over to keep them from being bothered by the very loud bell. A quirk of Morbier clocks is that they ring the hour twice. For example, at 4 PM the clock will chime 4 times, and then at 4:03 it will again chime 4 times. It also chimes once on the half hour. Some believe this repeat chime is a throwback to a time when a call to prayer would ring once to alert listeners and a second time to mark its beginning. The problem with the clock is twofold. First, it would not stay running. Second, the time (and chimes) were not lined up correctly. So far I’ve only addressed the first problem. At the request of the owner I have not taken the clock apart. I’ve used a synthetic oil to lubricate the gears and pivots and I’ve checked that none of the pieces are broken. Without taking the face off the clock I don’t think I’ll be able to fix the chimes. I do think it would be fixable without taking off any gears or opening up the movement itself. Just oiling the clock didn’t keep the clock running, and there were no major problem areas of rust. I lowered the pendulum about an inch and it ran for 3-4 days. 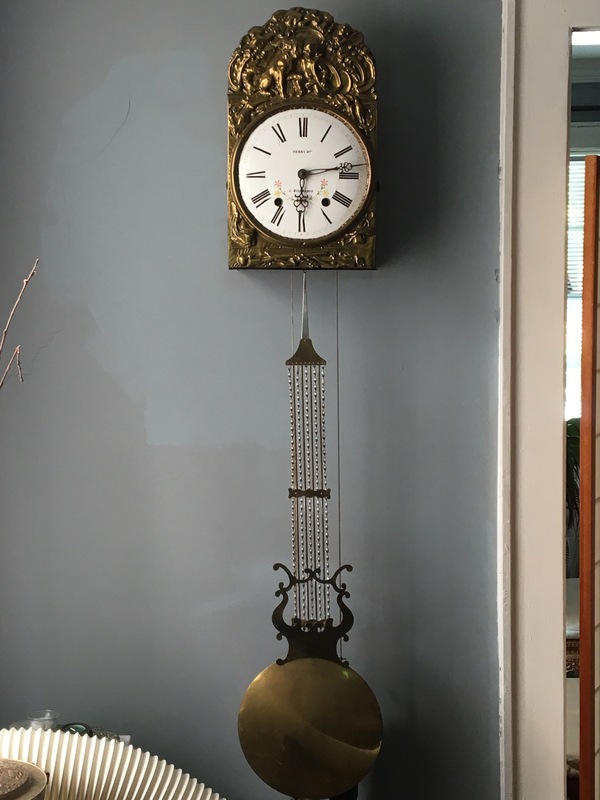 The owner reports that it was keeping proper time and that when it stopped again the pendulum was leaning against the edge of the slit that the pendulum swings through. As for what’s next, I’ll be taking out a level and checking that the clock case is perfectly level and perpendicular to the wall. If the pendulum is hanging on an angle I may need to bend something slightly, but I’m hoping not. Next up, trying to line up the chimes correctly.